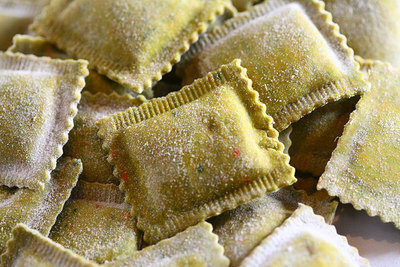 Ravioli should be kept frozen until ready for use. Fill the pot with 2/3 water and bring to a boil. When the water is boiling, add a heavy teaspoon of salt and add the frozen ravioli. Stir immediately so none of the ravioli stick to the bottom of the pot. Remove ravioli with a slotted spoon and drain. Add your favorite sauce or toss gently with olive oil and set aside for later use. Fresh pasta can be kept in the refrigerator for 4 days, freeze if you are not going to use it. Remove from freezer and defrost before cooking. When the water is boiling, add salt and the fresh pasta. Stir immediately so the pasta does not stick to the bottom of the pot. Cook uncovered: angel hair 2 minutes, linguini 3 minutes, fettucuini and parpadelle 4-5 minutes, extruded pasta 4-6 minutes.